Zwolle has yet another big cycle bridge; the Zalnébrug. This new bridge spans the N35 right at the edge of the built-up area in the south-east of the city. The N35 provincial road was expanded and a level crossing for walking and cycling would no longer be safe. The bridge was opened last week, on Wednesday 11 July 2018. These two elderly people on a recreational ride had no problem to conquer the new bridge. They even waved to the camera! The N35 provincial road to the south-east from Zwolle used to be an 80km/h road with one lane in each direction, now it is a 2×2 road with a speed limit of 100km/h outside the built-up area. (Video of the finished new road.) There used to be a level crossing for walking and cycling right at the beginning of the road at the edge of the city, but a signalised level crossing on such a big road is not considered safe or convenient. 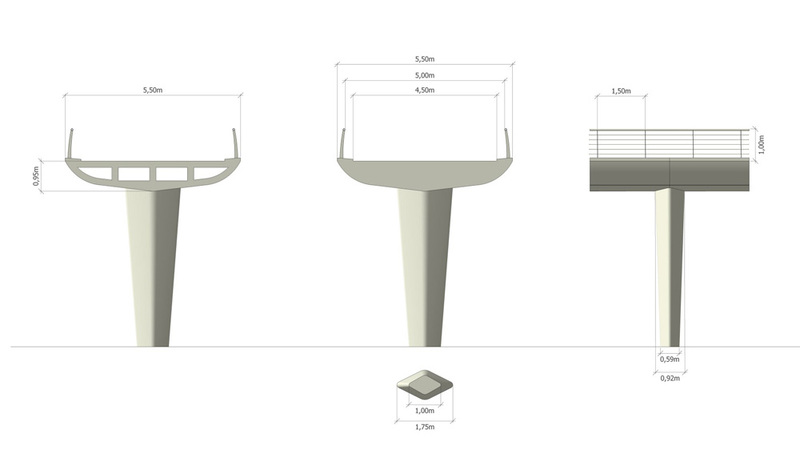 To create a safer crossing and to improve the traffic throughput a walk/cycle bridge was considered. At first the road budget seemed inadequate, but when the bids in the public tender turned out a bit lower than expected it gave room for a bridge after all. A sum of 2.1 million euro was found in the road budget and the rest of the cost, 1.7 million euro, was equally shared by the province of Overijssel and its capital, the municipality of Zwolle. The bridge under construction circa November 2017. The pillars are almost standing ready for the decks to be placed. Picture courtesy of ChrisZwolle/European Roads. Practically the same location in April 2018 when the bridge was still under construction. The decks had been placed in December 2017. The bridge connects the city of Zwolle mainly to a recreational body of water, the Wijthmenerplas, but also to a number of smaller towns, Dalfsen, Raalte and Heino, which makes this a good commuter route as well. The wide circle during construction. My own picture taken in April 2018. A rendering of the bridge and the intersection it bypasses. Picture courtesy of Heijmans. The bridge was designed by bureau MA.AN. The designers looked at the landscape to fit the bridge in well. Very typical for this region are the many embankments, earth rising up in the landscape. The curve in the bridge on the south-east side was therefore built atop such an embankment around a body of water (virtually dry in my video because of the current drought). That body of water is also meant “to prevent youth loitering there”, for whatever reason that was deemed necessary! The curved ramp on the south-east end was not only built because there is no room for a straight ramp there, it also makes it possible to go in three directions from that side, without having to go back a long way if you were to continue left or right, instead of straight-on. The wide curve on the south-east end makes the gradient of the climb very convenient. The concrete bridge decks were pre-fabricated in a factory in Friesland and transported to their end-destination by road. The 13 deck parts are 19 or 21 metres long and 5.5 metres wide. They weigh 132 metric tons and they were put in their place by two cranes in four nights in December 2017. People watched that from stands that were specifically built for that reason. Only when the two decks over the main carriage way were placed the road had to be closed for a few hours, one half at the time. Three of the decks are curved, the rest is straight. The bridge is very similar to the bridge in Enschede that I wrote about earlier. That bridge is much more curved, but the system of the pre-fabricated decks on the pillars is the same. The pillars as they were built. Twice as wide as in the original design. But the appearance of the bridge is still stylish and slender. The bridge deck is 5.5 metres wide. Winning! This boy is already at the end of the circle while his mother is just about to start the descent with his smaller sister. The pillars were designed differently at first, even more slender. But the designer found out that didn’t meet the building regulations. The pillars must be strong enough to withstand a collision with a truck and that was not the case. Reluctantly the officials accepted the changed design in a council meeting in April 2017. “The bridge needs to get ‘fatter legs’; not so aesthetically pleasing, but a lot safer”, said one. The 250-metre-long bridge has a clearance over the road of 4.6 metres. The long ramps make the gradient very convenient. People who were interviewed on the opening day were very positive. To finish the project a work of art was opened: a giant wooden bicycle seen from the front. The giant wooden bicycle is a work of art. Art is an integral part of most Dutch tunnels or bridges. I filmed the bridge two days after it was open. The area is still a lot of barren dirt, but the green grass will soon return. Some school classes used the bridge to get to the lake for a school outing. The children were all most likely using the bridge for the first time. The big curve down was reason for a lot of fun. Some shouted “roller coaster” and most cheered like they were on one. This bridge makes crossing a main road convenient and fun, quite literally! My video about the Zalnébrug. A ride over the new bridge from both directions. Amazing – more so when you consider that if that had been done here in the UK they would have stayed with the level crossing and it would have taken 10-15 minutes and a series of push-button crossings to get across. What was the plan in case the road building budget didn’t have spare money? Looks perfect for a tunnel. I hate bridges much more than tunnels. With the tunnel, you get the descend first. It also adds less height meters because you don’t have to count with the height of trucks. Then it could also do away with the whole roundabout. But socially the bridge might be considered safer, since the drug dealers on their scooters hang out in tunnels, not on bridges. What is the percent grade on the ramps? Are the railing ends finished? It seems like it would be possible to terminate the railings a little less abruptly in case someone bumps into one. This entry was posted on 17 July 2018 by Bicycle Dutch in Original posts and tagged big bridge, bridge, exceptional cycling infrastructure, Zwolle.